Have you ever wanted to transform your “Shaky-Cam” hand-held footage into a smooth as silk Steady-Cam shot? How about seamlessly replacing the words on a road sign as it was shot from a speeding car? You can with this tutorial on Adobe After Effects: Motion Tracking and Stabilization. This stealth technology, first developed for military use for intrusion detection and facial recognition is a standard feature in After Effects. It’s a “must know” technique that every video producer and editor has got to have in their personal production arsenals. 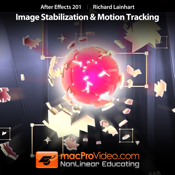 Join star trainer, Richard Lainhart, as he demystifies the motion tracking process. You’ll learn the how to accurately map the X/Y pixel data of an object in a scene. Next, you’ll see how to use that very same data to generate the necessary coordinates to stabilize a scene and/or track an object’s motion as it moves through a scene. Though this not the simplest of processes, Richard Lainhart breaks it down into easy to follow, understandable steps. Next Richard takes motion tracking to a new extreme by seamlessly replacing the text on a “moving” sign using advanced mulit-point tracking and corner pinning. The sign’s changing perspective makes this an very interesting task! Many different techniques come together to make this kind of advanced video voodoo possible and Richard is there, explaining everything, every step of the way.